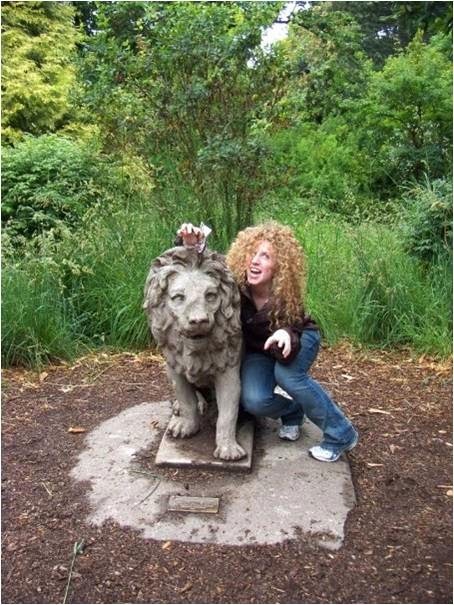 Poodle Writes: Kimber vs the Koala ... and a Giveaway! I got an email a while ago asking me if I was interested in getting free stuff to blog about. The brands involved would be Lamaze, Boon, John Deere, and more. Of course I said yes, because free stuff! Any niggling doubts about "maintaining the artistic integrity of this space"? Uh, what artistic integrity? I blog about leftovers and hating pandas. It's not like I'm pimping out anything Pulitzer-worthy. But then they wanted to see my blog stats ... and let's just say my blog is pretty "boutique" if you know what I mean (you, dear reader, are one of a very select few). So I sent my feeble pageview report, along with a rambling note about how my life's biggest regret is not taking a spin on my dad's riding lawn mower before he sold it when I was twelve (now I realize they are involved with the John Deere toy brand and cannot actually hook me up with an actual mower to review ...). Apparently they didn't care that my blog is a mere freckle on the ginger's face that is the internet, because they sent me these colorful little things to review. May I present: "Shine-a-light, Freddie," and "Cuddle and Squeak Koalas" of the Play and Grow™ collection. Really, though, I think Ruby should be the first one to weigh in. Thanks, Mom. I'll take it from here. I like the Cuddle and Squeak Koalas the best. I told Mom to keep the tag on the book because I don't really get the whole soft book craze. Is it a toy? Is it a book? Does it go on the bookshelf? Or the toy bin? Personally, I don't think literature needs any added tactile element. I need to feel the story, not the crinkly pages. But that's just me. I'm letting Mom give it to someone else's baby. I do like the koalas. 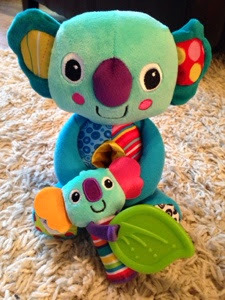 They are soft and colorful (I'm crushing on the teal color scheme--primary colors are so overdone), and the mama koala even has a black and white pattern on her booty that really catches my contrast-attracted baby eyes. The mama koala (I guess her name is Cuddle, because she doesn't squeak. And big props to Lamaze for not calling her Kuddle--eww.) also has ears made of potato chip bags. This is where I want my crinkles. She also has a silk tummy pouch thingy where her baby, Squeak, can hang out. Koalas are so cute. They're like the love children of Yoda and a Muppet. Squeak, as you may guess, squeaks when I grip her in my adorably dimpled baby fist. 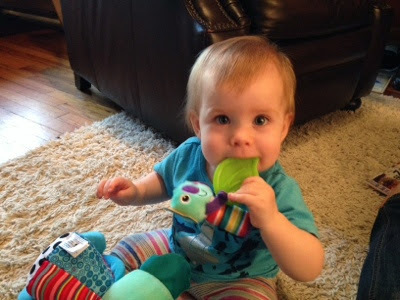 She's also holding on to a eucalyptus leaf replica, made of a softish plastic--just right for chewing. Incisors are coming in ... nom nom nom. Unfortunately, I lost Squeak immediately after this picture was taken. Mom finally found her behind the couch a week later, along with the baby fingernail clippers. So now I get a manicure out of this, too. Score. Back to you, Mom. A baby koala with her mama koala with a baby who hangs onto her mom like a koala. ....INCEPTION KOALA. Thanks, Ruby. Now for my review of Cuddle and Squeak. Like Ruby said, Squeak was a victim of Graham's creative toy storage ideas, so this will be about Cuddle. At first I was a bit wary of the mother koala with her matronly eyes, and those arms sewn permanently into a demurely peaceful clasp at her tummy. I'm a perfect mother, she seemed to taunt. But you already lost your baby! I responded. She ignored me, and instead went about proving how superior she was to me. First, she cleaned out my fridge. Note the contrast-patterned derriere. Showoff. Despite her sewn-immobile arms (and lack of hands, if you get down to it), she managed to do that condescending thing where you pick something up with just two fingers, holding it as far away from your nose as possible, pinky up ... you know what I mean. What she asked is this? Liquefied cilantro, get a hold of yourself. Then she moved on to the dishes, utilizing her silky, anatomically-incorrect tummy pouch to wield a toy koala-sized scrub brush. Next, she tackled my two-week backlog of laundry. She did give me a nod when she saw I use homemade laundry detergent. I just reuse an old dispenser. Don't think I'm lying. "Where did all the laundry go? Oh, I just washed, folded, collated, and put it away according to color and frequency of use. Except your favorite, grody old t-shirt. I cut that into scrap rags to use when I refinish that end table you've been neglecting to tackle for years. Hope you don't mind." My ego shredded, I offered to let her adopt Graham and Ruby. They'd certainly fare better in her plush hands. Oh dear, she clucked, I'm not here to replace you! I'm here to inspire you to embrace the nurturing mother koala that is inside you! Be soft, cuddle™ your children a little closer, and get off your lazy, non-eye-catching duff and clean your house more often. I accepted her counsel, and then watched an episode of The Mindy Project while she made tomato soup. A recipe from her bff Gabby over at designmom.com, she tells me. When I found out she sourced her basil from Kroger, and not her own windowsill herb garden, I felt a little better. So I got shown up by a plush koala. That's okay. I had been a little cocky in my mothering since Ruby did her first sign ("all done"--a beautiful double-handed princess wave, ahem). In other, exciting news, today I get to give away Cuddle's second cousin (and preferred babysitter when she and her husband, Snuggle, go out), the adorable Toot Toot Toucan! His stripy beak squeaks, his ribbon tail is so on trend, and wouldn't the removable bead ring he's clutching make a killer bangle? It's like Toucan Sam, but with no sugar guilt! To enter the giveaway for Toot Toot, leave a comment about what chore you wish Cuddle would take over for you. Also, for additional entries, you may choose to provide my blog with free marketing by tweeting, Facebooking, instagramming, or whatevering this giveaway. The winner will be announced this Sunday ... my birthday! Good luck, and may this toucan's large, embroidered eye look upon you with favor. P.S. 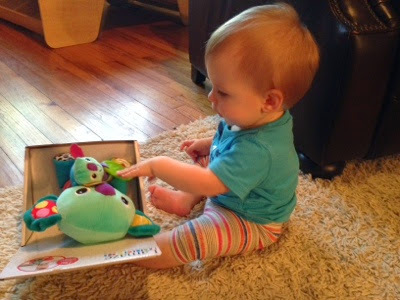 Lamaze is also running a sweepstakes for the entire Play and Grow collection. Check it out below! We're all smiles now that spring has sprung! Parents, does your baby have an adorable smile? 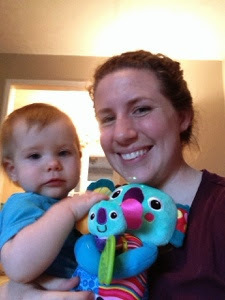 Through Thursday (May 1), enter the Lamaze Spring Smiles Sweepstakes at http://a.pgtb.me/xdmhfS, and you'll have the chance to win a fabulous prize pack that includes brand new spring toys from Lamaze. Just upload a photo of your child with any Lamaze toy, tag it with #TOMY and #Lamaze, and ask your friends to vote for your photo. Voting takes place today through Monday, May 5. 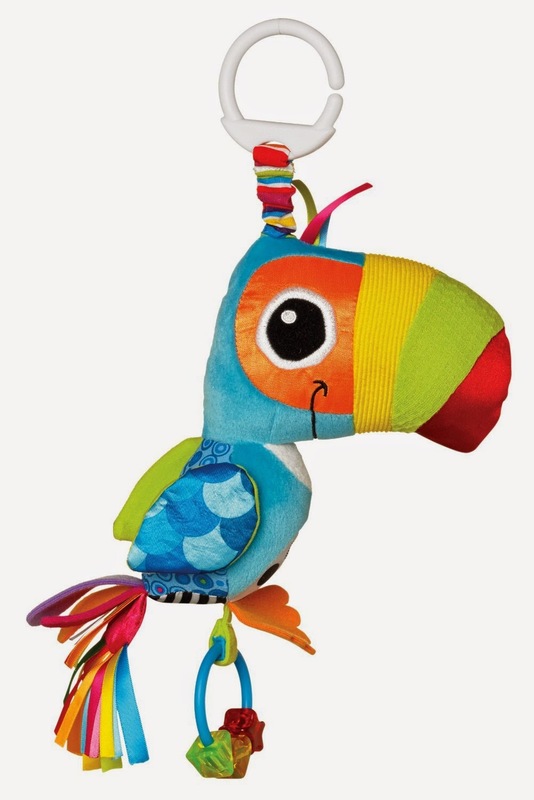 The lucky parents who receive the most votes for their cute photo will receive more than $100 worth of adorable new Lamaze toys that include Play and Grow, a peekaboo book and an activity gym that grows with your baby! So...get out your Smartphones and share those baby smiles with the world! I wish Cuddle would come and do my dishes that have been sitting there for... longer than should be admitted on a public forum. Fun! 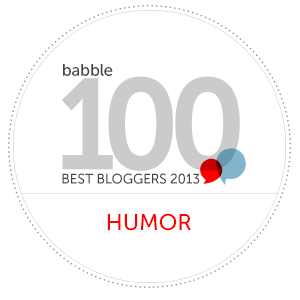 You are so funny! I'd love for him to do laundry! It's never ending! Hmmm, so many options, does weeding my flower garden count as a chore? Or maybe changing all of my children's diapers for the next 5 years. That sounds pretty good. Maybe finish growing this baby for me. Looks like she's got a nice pouch there. I need Cuddle to come be my resident cockroach killer. Is that a chore?? Probably to do dusting, because I forgot that was a chore for the last...er...few months. Or maybe 8 months. But doing the last couple weeks worth of dishes would be great! I need cuddle to clean go through all the children'a clothes! I'm sure it will take her about two minutes. Am I too late?! I need Cuddle to rinse out August's poopy diapers before they go in the bin. Ugh.